Two Chicago-area fighters are leaving Columbus, Ohio with victories, while Miguel Torres is leaving with his second consecutive loss. Bart Palaszewski took on the very tough Karen Darabedyan in a lightweight battle. Bartimus immediately felt the power and quickness of Darabedyan, who was coming off an impressive win against former WEC champ Rob McCullough. Darabedyan had Bart on the ground and was delivering punishment. Bart absorbed a lot of blows but kept looking for subs. Near the end of round 1 Palaszewski latched on to an arm and hyperextended it until he got the tap. Itwas an amazing submission and Bartimus moves to 34-13 with the win. 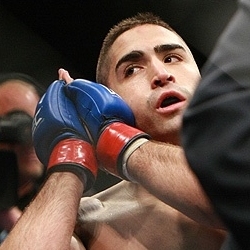 Team Top Notch fighter Ricardo Lamas was coming off a TKO loss to Danny “Last Call” Castillo at WEC 42. He needed little time to get back on a win streak with a stunning defeat of France’s Bendy Casimir. In round 1 action, Casimir went for a takedown and Lamas delivered a fierce knee to Casimir’s head that crumbled him to the canvas and left him unconscious. The Bully got the win and improves to 8-1 overall and now 3-1 in the WEC. Miguel Torres never really got going against Joseph Benavidez, his first fight since losing his WEC title to Brian Bowles. Miguel was active in moving and circling the cage, but couldn’t find the timing on his strikes or kicks. The faster Benavidez easily nullified the nearly 10-inch reach disadvantage with takedowns and easily working his way inside against Torres. The last takedown in round 2 proved fatal for Torres. Benavidez had him up against the cage and delivered a vicious elbow that gashed open Torres’ forehead and immediately started to gush blood. Torres tried to escape but Benavidez caught him in a tight guillotine and Torres was forced to tap. It was a stunning defeat for Torres. Brian Bowles lost the title to Dominick Cruz, so perhaps we will see a Bowles/Torres rematch down the line.